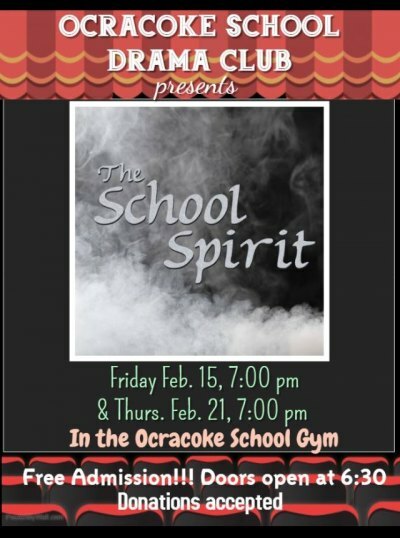 Opening night will be Friday, February 15th at 7pm in the Ocracoke School gym, with a repeat performance on Thursday, February 21st at 7pm. Doors open at 6:30pm. Admission is free, but donations are happily accepted and proceeds will go to the school and local arts organization Ocracoke Alive. To earn a high school diploma on Ocracoke, each student must complete a senior research project with the guidance of an adult mentor, and make, produce, or create something to show what they've learned. For her project, Caroline chose to "revive the school drama program" with help from high school English teacher Charles Temple. Caroline started an after-school drama club last fall and taught regular workshops on acting to any and all interested students. As she learned to work with her actors, she looked at possible plays that they could perform with a small cast in a school setting. Charles gave her a catalog of plays written specifically for school drama programs, and that's where she found the one-act dark comedy "The School Spirit." "It's a story with good morals," she said. "It has an anti-bullying message, and a 'don't text and drive' message." It's also a ghost story. 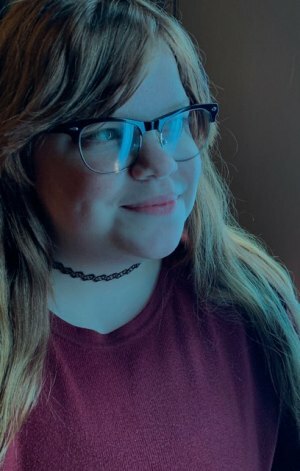 The main character, Faith, likes theater and wants to audition for her high school's production of "Pride and Prejudice," but her best friend, Ivy, recently died and is haunting her. No one can see or hear Ivy but Faith (and the audience) as Ivy comments on Faith's interactions with a cute boy (there always has to be a cute boy) and some really mean girls (there always seem to be those, too). Faith's parents and the school drama teacher round out the cast of nine Ocracoke School students, plus one teacher and one graduate. "It was really hard making decisions about casting," Caroline said. She was happy to say that the drama club members who won't be onstage are helping backstage with costumes and lighting. And it's a family affair for her; both her sisters, Jordan and Kenzie, have parts in the play. "Kenzie's the meanest mean girl," Caroline laughed. "And we had to get a wig for Jordan so she looks like a normal mom." Caroline's interest in theater started in 10th grade when she developed a passion for Broadway musicals. She's been "admiring them from afar" ever since. She celebrated her 17th birthday with a trip to Charlotte, NC, to see "Les Miserables" onstage. She also discovered a love for plays, especially Shakespeare's. She'll be heading to Methodist University in Fayetteville, NC, in the fall where she plans to major in theater arts and education. "I'm very excited! Methodist University was my first choice," she said. "They have a big drama program, and a pretty campus. I want to be involved in any way with a musical; I have very little experience, so I'm just excited to be involved." Caroline played a Village Girl in the 2018 cast of "A Tale of Blackbeard" and she also sings in the Ocracoke United Methodist Church choir, and with Martin Garrish at the Coyote Music Den. She helped Heather Johnson with the costumes for the spring Arts Week play in 2017; "costume design is under-appreciated," she said. "I love teaching and I love directing – telling people what to do," she said. She hopes that a major in theater and minor in education will allow her to direct a school drama program. "I spent one year in school in Raleigh in 5th grade and we had a great theater program. Why don't we have this in Ocracoke School?" she asked. Indeed. Why not? The cast of "The School Spirit" is lucky that Caroline stepped up to provide this experience. They all committed early to the project. "Even though I only have three lines, I'm totally immersed!" said Starr Ely. I believe that Hannah means "lit" as in the Urban Dictionary definition of "turned up or popping or amazing in any sense." I'd also like to think of "lit" as "literary" with the play's many allusions to "Pride and Prejudice" (a timeless classic). "There are similar themes to 'Pride and Prejudice,'" Caroline said. "Faith memorizes Lizzie's monologue from 'Pride and Prejudice' for her audition, and her teacher compares her to Lizzie. The dynamic between Caroline Bingley and Lizzie is present as well as the role of Mr. Darcy." "Basically, the moral of the story is 'Don't die when you're 17,'" she said. I'm sure Jane Austen would approve. "The School Spirit" stars Hannah Belch, Mariah Temple, Kenzie Novak, Corey Yeatts, Michael Shoemaker, Jordan Novak, Starr Ely, Becky Boos, Iris McClain, Elsie Kattenburg, and Parker Gaskill. Backstage helpers are Christian Stevens, Finn Kattenburg, Jesi Franklin, Cody Pinter, Charles Temple and stage manager Katie Kinnion. Thanks to Ocracoke Alive for the use of their theater equipment.